Rhode Island is the smallest of the 50 states and except for New Jersey the most densely populated. The dominant physiographic feature of the state is the Narragansett basin, a shallow lowland area of Carboniferous sediments, extending into SE Massachusetts and, in Rhode Island, partly submerged as Narragansett Bay. The bay cuts inland c.30 mi (50 km) to Providence, where it receives the Blackstone River; it contains several islands, including Rhode Island (or Aquidneck), the largest (and the site of historic Newport); Conanicut Island, with the resort of Jamestown; and Prudence Island. The coastline between Point Judith and Watch Hill is marked by sand spits and barrier beaches, sheltering lagoons and salt marshes. Glaciation left many small lakes, and the rolling hilly surface of the state is cut by short, swift streams with numerous falls. Although more than half of Rhode Island is covered with forests, it is highly urbanized. 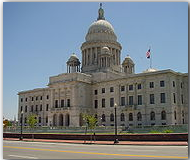 Providence is the capital and the largest city; other important cities are Warwick, Cranston,Pawtucket, and Newport.